Introducing the revolution in bike training with the Cycleops Phantom 5 Indoor Cycle. There are many Bikes in the marketplace but none provide the smooth feel of the Cycleops Phantom 5 Indoor Cycle. Rated highly by many users and Fitness experts gives this Bike the number one spot on our list for home and institutional use. 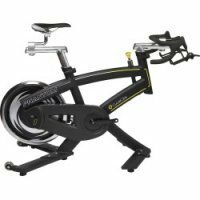 With its high quality and smooth feeling, its no wonder why many customers are buying the Cycleops Phantom 5 Indoor Cycle over other top name Brands. Cycleops Phantom 5 Indoor Cycle is becoming a leading indoor cycle in the fitness industry. The CycleOps Phantom 5 Indoor Cycle is the evolution of everything we know about cycling performance at CycleOps. The CycleOps Phantom 5 Indoor Cycle combines ten years of research and development in the category, listening to cyclists of all levels. And what we all share is the craving to re-live that epic ride. Now we can; with the CycleOps Phantom 5 Indoor Cycle, you can recreate any ride captured on your Joule. On any day, any season, in any weather, any time. When your purchase this Bike you will have the ease of mind that assembly will be a piece of cake. The unit already comes roughly 85% Pre-Assembled. As well as coming nearly fully assembled, a hardware package is included to help with the remaining assembly required. This video will demonstrate how easy it is to set up your Cycleops Phantom 5 Indoor Cycle. The Cycleops Phantom 5 Indoor Cycle is easy to maintain and clean. This video will demonstrate that to you. Riding your favorite course doesn't have to be weather or traffic dependent anymore. The Cycleops Phantom 5 Indoor Cycle uses electronic resistance control technology, making it possible to duplicate the most extreme grades and allowing you to try different gear combinations for optimum pacing strategies. You will need your PC, and iPad or other Tablet to use electronics on the Phantom 5 "Call with any Questions"
PowerTap Technology gives you precise feedback on your workouts so you know they are achieving your goals. Joule takes workout metrics to a whole new level, managing performance data with dashboard functions, ride reports, history and workouts. Joule 3.0 included. The Cycleops Phantom 5 Indoor Cycle is the evolution of everything we know about cycling performance at CycleOps. It combines ten years of research and development in the category, listening to cyclists of all levels. And what we all share is the craving to re-live that epic ride. Because you demand a great fit, Cycleops Phantom 5 Indoor Cycle Series incorporate four points of adjustment. Because you expect a highly effective workout, they offer precise resistance control. Quickly adjust all geometries necessary for creating the perfect fit. You also want a bike that lets you sprint. So frame stiffness and stability is second to none. In essence, you want every aspect of your indoor cycle to duplicate the experience of riding outdoors. That's why all Pro Series indoor cycles come with freewheel gearing so you can coast whenever your pace dictates to recover between efforts. The CycleOps Indoor Cycle exercise bike is perfect for someone looking for the ultimate in home fitness training. If you are looking for an exercise bike for the ultimate home training experience then look no further. An exercise bike like this is designed for those who are really serious about their bicycle training; someone who needs to train to the highest standard whatever the time of day or the weather outside. If youre training for triathlon or serious road racing then a bike like this can be invaluable. To start with the CycleOps Indoor Cycle is a heavy bike. It comes packaged and delivered to your door but after that youre on your own and youd probably be better off if you have a friend on hand to help get the package inside. Once unpacked you are faced with a large bicycle shaped jigsaw puzzle that luckily doesnt have too many parts. Time taken to put the pieces together: 25minutes and 23 seconds. Yes, we do put bicycle trainers together a lot here but it really is simple and you should be up and running on your new CycleOps Indoor Cycle within 30 -40 minutes. Once assembled its pretty easy to move around thanks to the wheels incorporated at the back of the bike. The CycleOps Indoor Cycle is fantastically flexible in its set up. You can adjust both the handlebars and seat position to your exact specification. This means that you can set it up to mimic your road bike so as to make the training as effective as possible. This is ultimately better than using a turbo trainer or bicycle rollers as you can train as if you were on your bike, without damaging and wearing down your bike. If you need to justify splashing out on this exercise bike youll be relieved to know that it can fit quite a variety of people, so your other half can use it to keep fit when youre not training. A feature I especially like on the CycleOps Indoor Cycle is the fact that you can swap the saddle out for your own, thus making the experience as close to training on your own bike as youre going to get. And yes, you could put your comfy Brooks commuter saddle on the bike if you wanted to (not that that would help your training, but its nice to have options). The actual ride on the CycleOps Indoor Cycle is great. The 48-lb flywheel makes sure that starting and stopping is as smooth as you could wish for. You can throw your weight around on this exercise bike, getting out of the saddle for serious sprints and climbs without as much as a wobble. The resistance is adjusted using a dial on the front of the Cycle, it is seamless so you can very easily adjust it to the exact amount of resistance required. Now what makes this exercise bike special is its power output reading. You can fine tune your training sessions to make them consistent over and over again. This is a feature that professionals will really appreciate as they look to fine tune elements of their fitness. The electronic interface can be tailored to fit your exact training program. The CycleOps Indoor Cycle can store up to 150 hours of output from your training sessions before you download it on to your computer. Once there, the Cycleops Poweragent software that comes with the PT300 is pretty easy to use and allows you to really analyze your training data, excellent for eking out that extra percentage point of performance that can mean the difference between winning and losing. The data is downloaded via simple USB connection. You can replicate hill climbs and sprints at set power outputs and the same cadence repeatedly. Its easy to adjust and easy to train on. CycleOps Indoor Cycle is fantastic for interval training. You can use it to warm up on before getting out on the road or to warm down when you get back. Overall the CycleOps Indoor Cycle is a professional grade bicycle trainer that if you have the money & space for it will revolutionize your training regime. You will no longer need to attach your bike to a turbo trainer or balance it on rollers. With hugely detailed data output and wireless heart rate monitoring you can track and compare all of your training sessions for a completely optimized training regime. This is crucial if you want to eke out those extra few percentage points of performance. If youre serious about your training: CycleOps Indoor Cycle, I promise you will not regret it. Fitness Warehouse is an Authorized Dealer for Cycleops Product. You will be receiving the full manufactures warranty. Your warranty covers all parts for 1 year, electronice for 1 Year and a lifetime coverage on bike frame.